Grow bags are bags of potting soil. Seeds or young plants are planted in holes that are cut out of the bags. Grow bags are portable and space-efficient. Most standard grow bags measure 13 inches by 37 inches, according to BBC Gardening, and are perfect for vegetables with shallow roots, such as tomatoes, peppers and peas. Many grow bags are sold specifically for growing vegetables. These bags are usually made out of biodegradable materials and come already filled with potting soil rich in organic matter. You can also make your own grow bag by filling a plastic or fabric bag with potting soil. Grow bags are ideal for peas because they prevent weeds from growing, which can be a big threat to pea plants, according to the University of Illinois. To prepare your grow bag for planting pea seeds, kneed the bag to loosen up the soil, or fill your own bag with potting soil. Before you fill it, poke holes in the bottom so the soil will drain. Then securely close it at one end and lay it horizontally where the plants will be grown. Finally, cut out squares or a row along the top where the pea seeds will be planted. Pea plants, like most vegetables, need full sunlight to grow and produce well. It is important to choose a good location for your bag before you plant your seeds. It is difficult to move a heavy grow bag after the seeds have been planted and the soil has been watered. Not only are they heavy, but movement can disturb the seeds or young plants. Set your bag in a warm, protected location where it will get a full day of sunlight. Plant pea seeds an inch or so deep, with a space of about 1 inch between each seed. They grow well in rows, so you may want to cut a row out of your bag rather than individual squares. If your peas are climbing (or pole) peas, you will need to provide support for them. Push canes into the bag next to each small pea plant, or place your bag close to a trellis. If they are bush peas, you can skip that step. Keep the bag well watered--peas thrive in moist conditions, according to the University of Illinois. Harvest peas from the bottom up. 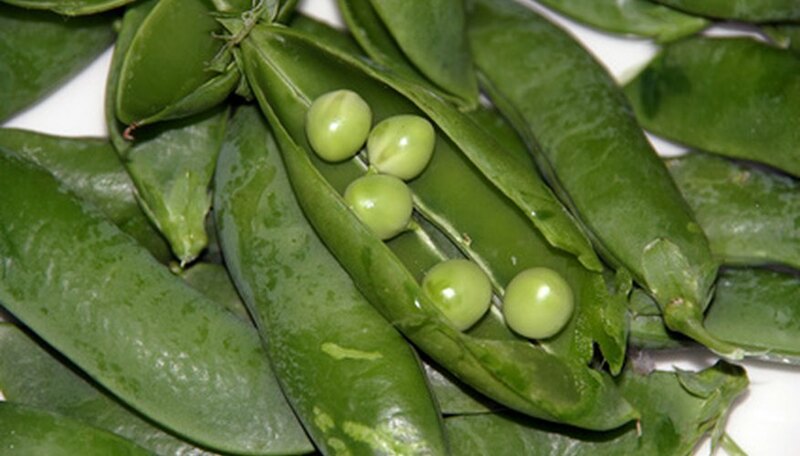 The ripening time will vary according to the type and variety of pea, but on average, most types ripen between 12 and 16 weeks after planting. Look for rounded, but not split, pods. Pick one or two each day to see what they look like. The peas should be fully round, but not too firm. Once they reach that stage, go ahead and harvest the plant. When the harvest is over, cut the plant back to a few inches from the ground, but do not pull it from the grow bag until it completely dies and returns nutrients to the soil.